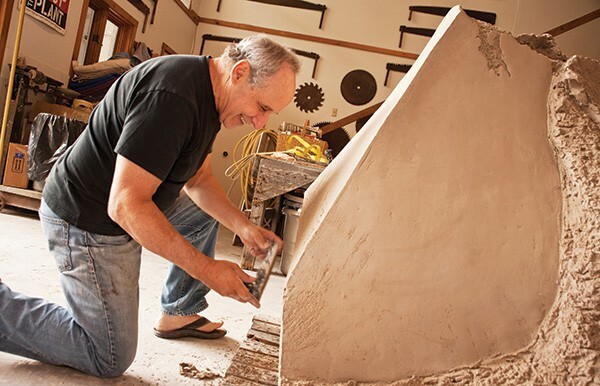 Chaleff’s only two-dimensional work, a series of large clay tablets, hangs in the gallery of the studio and residence he shares with his wife, author and professor Haesook Kim. The ascent up Poole Hill Road in the tiny town of Ancram in southern Columbia County provides a view of rolling fields and farm hedgerows that's so exquisite (especially during foliage season), it seems conjured from a fairy tale. Country houses and estates of all types and styles are tucked in along the rise, including one made conspicuous by the large four-piece sculpture in its front garden. This house is conspicuous for other reasons, too. 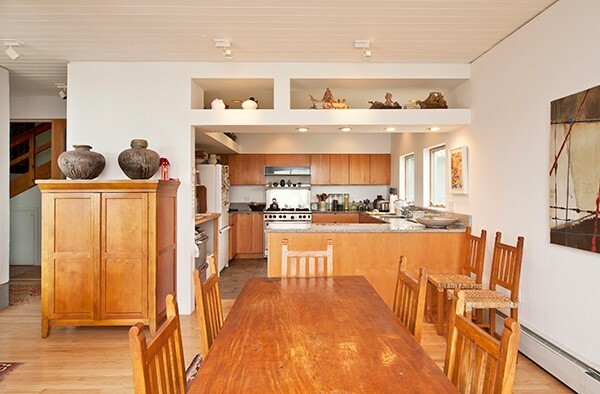 Since it was built in 1984, it's been home not just to one artistic genius, but two. 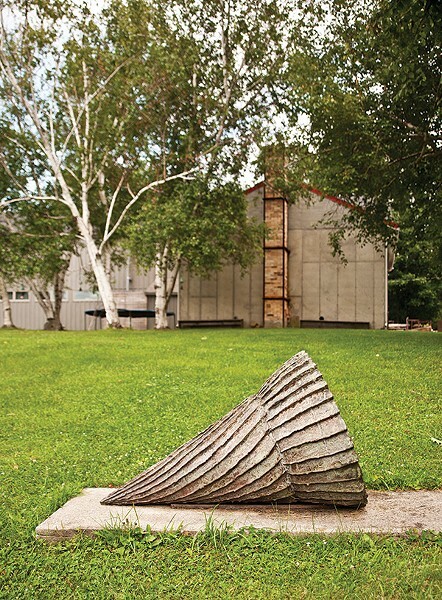 Back in the 1980s, modern English sculptor Anthony Caro, once an assistant to artist Henry Moore, built a studio and small apartment on the property as his American headquarters. Caro made important breakthroughs in his sculpting career shortly after arriving in the US that cemented his reputation as one of the world's leading modern artists. He soon shifted his work to make brightly colored horizontal assemblages of welded steel and industrial materials, many of them large in scale. He was able to realize his vision in part due to the gantry crane he installed at the Ancram property. Knighted by the Queen in 1987, Sir Anthony decided to sell the studio and its surrounding gardens in the mid-1990s to move back to London. He died last year, leaving behind an impressive body of work. 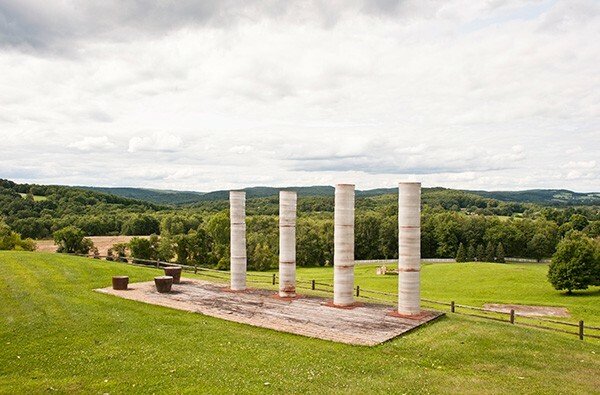 Created by Chaleff to celebrate the couple’s wedding in 2007, the four-piece sculpture, Eleven Eleven, defines the front landscape. Enter Paul Chaleff. The Caro studio was a perfect fit for his large-scale work in clay, which at the time was also inspired by industrial forms. In fact, the two artists had been good friends for years, regularly discussing artistic issues and consulting each other on projects. Not everything about the property was to Chaleff's liking, however. "When I purchased the place in the late 1990s, I did extensive renovations that changed the exterior, and I redesigned the interior completely," Chaleff says. 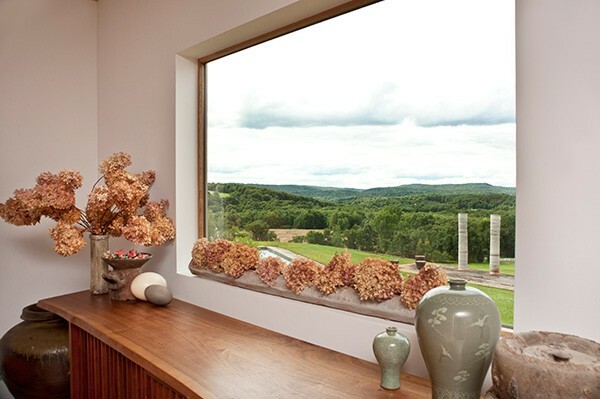 "That included new window placement to make better use of light and views." Chaleff did all the design himself, contracting with local builders to do the work. 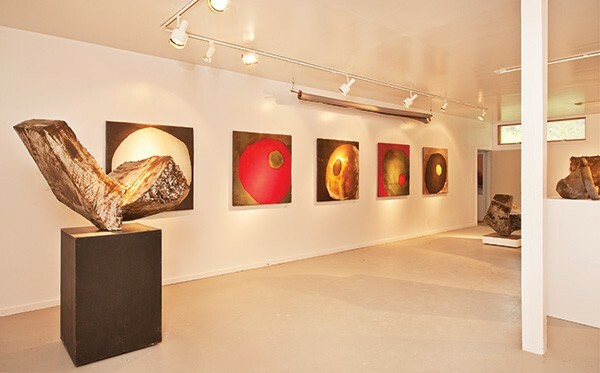 Chaleff's renovation kept the studio largely intact, but added square footage for a large gallery and a more spacious and elegant living space. 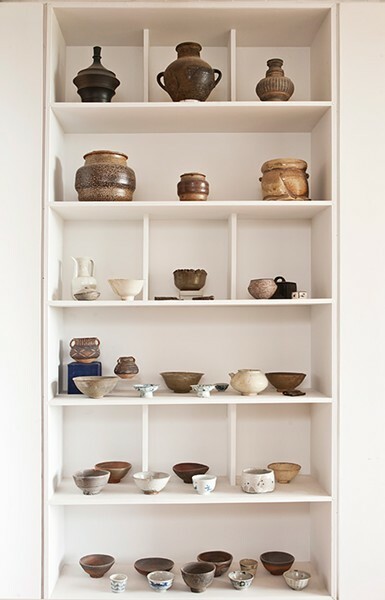 He and his wife, Haesook Kim, an author and professor, decorated it themselves, balancing Eastern and Western influences with quiet simplicity, rich textures, and lots and lots of books. Even still, the living quarters occupy only 20 percent of the overall structure. 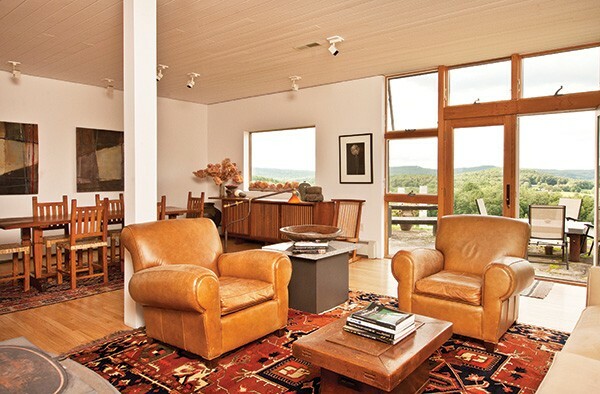 In the living room, large curtain-free windows frame the impressive, ever-changing view down the valley. A pair of matching metal-and-mica lamps by Tom Hoff give a kick to soft leather upholstery, while a two-legged Nakashima chair adds whimsy and a Frank Stella print gives a punch of color to the kitchen wall. Floor-to-ceiling glass frames the north view, allowing lots of natural light into the residence. "There's a Taoist philosophy that advises one to defend tranquility and nourish goodness," says Kim, who developed the Asian Studies program at Long Island University in Brooklyn, where she also teaches sociology and anthropology. What does that mean? Live like an artist, she says. "It's a great privilege to be with Paul and to live in a place that is so beautiful and connected to nature. Our home is just perfect." In 2007, Chaleff and Kim were married here under that prominent four-piece sculpture, which, by the way, is titled Eleven Eleven for the 11-foot height of the stacks. "This is my paradise," Chaleff says of the property. Kim agrees. "The whole house carries the spirit of art," she says. A near-drowning experience at age 20, which took the life of his best friend, inspired Chaleff to become an artist. "I wanted to be very good at something. I also wanted to be very simple and very honest." The Hudson Valley soon beckoned. "At the time, Pine Plains was the closest town to New York City with no zoning," he says. "Artists often have to find alternate ways to do their art." Chaleff also figured out how to incorporate water into his work as a way of making peace with the accident. Many of his sculptures function as fountains. On the Ancram property, Chaleff uses the gantry crane and other hoists and lifts installed by Caro to move his materials and completed pieces. "The studio is definitely a place full of boy toys," he says, smiling. Everything here is on wheels, including work tables and what seem like dozens of laundry-cart-size plywood boxes that hold tools, materials, and works in progress. 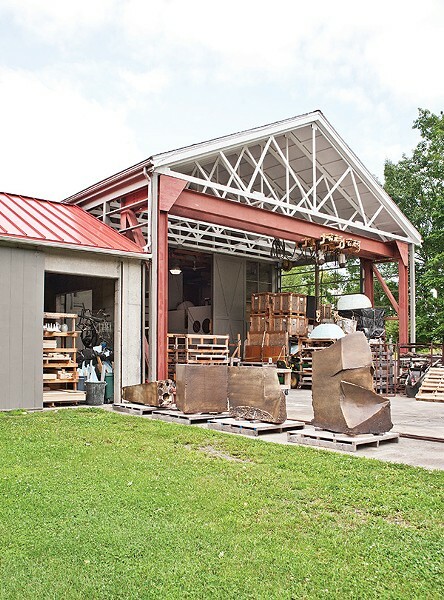 Like Caro, Chaleff's artistic genius has blossomed in Ancram, in part thanks to the 30-by-40-foot wood-fired kiln he built for firing massive clay sculptures. After studying in Asia early in his career, Chaleff became a champion of unglazed pottery, which he has helped popularize in the West. His study and experimentation in the medium of clay has allowed him to reach new horizons artistically, particularly with heavy large-scale pieces that require scientific and technical knowledge to be successful. What happens to clay at a certain size when it's fired? How much shrinkage will there be? Where are its limits in terms of shapes, mineral content, glazes, and other variables? He's answered these questions for each new series of work over the course of his 50-year career. What about those large sculptures that dot the gardens? It turns out a series of internal clay boxes are the best way to support their massive structure. In the upper story of the studio, which is part gallery and part assembly room, busts of six soldiers sit on a pedestal, part of an exhibit honoring the first one thousand American killed in the 2003 war in Iraq. Chaleff used only black-and-white photos of the soldiers for reference, but chose each soldier by the date he died—April 4, 2004. (Many were immortalized in the book by Martha Raddatz, The Long Road Home [Putnam, 2007]. "What's significant but not understood in the West is that in Japan, Korea, and other Asian cultures, the number four is a homonym for death. Choosing April fourth in 2004, or 4/4/04, was very meaningful." Chaleff is himself a soldier in an artistic battle. In the West, the art world views clay as more of a craft medium than an artistic one. "That's a prejudice that doesn't exist in Asia," says Kim. "The Met and MoMA have his work in their collections, but Paul has this pioneering spirit and the courage to do new things with or without public adoration or praise." The outcry among clay artists for recognition is what Chaleff calls a reasonable over reaction. He participates on a committee at the Metropolitan Museum, where discussions about label review get the younger artists riled up. They want no mention of "process" in exhibition labeling, because they want their art viewed as art, not craft. 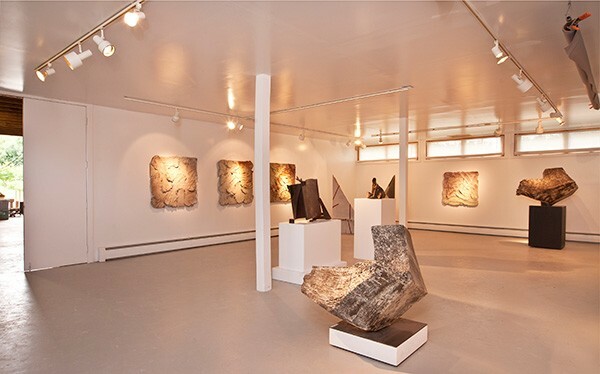 Chaleff's studio opens directly into a large professional gallery with high clerestory windows for natural light. Here hang the artist's massive tablets, the largest pieces of fired clay ever created and one of his more recent projects. Chaleff spent three years making adjustments to the materials and firing process in order to get them just right—all before summoning his artistic talent. For 20 years before turning to sculpture, Chaleff made pottery, much of it on a large scale, but he insists that humankind used clay to make art long before pottery. "The oldest pots in the world are 18,000 years old," he says, "while the oldest clay art is 31,000 years old." 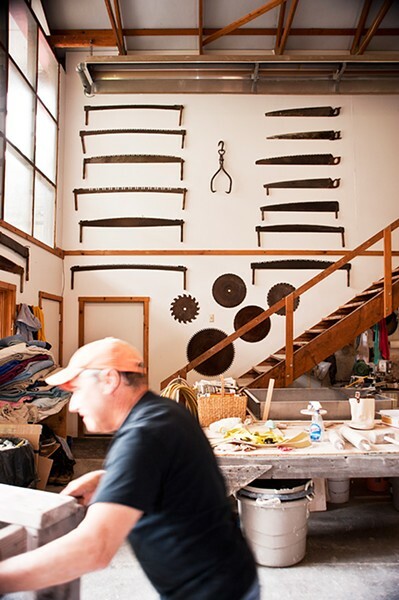 Whether he's hoisting a 5,000-pound sculpture or testing the compressive strength of a clay formation, Kim says, "the studio is where Paul is most happy." Chaleff and Kim’s pottery collection ranges from pieces from 4,500 BCE to work by contemporary Americans like Karen Karnes.